Designed for visitors as a pre or post tour to a 7-day Alaskan cruise or an add-on to a business or convention trip. 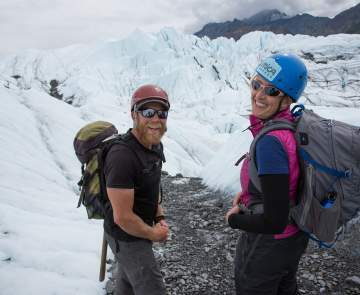 Your limited time is best spent in the Mat-Su Valley where you can experience the grandeur of Denali, trek on a glacier, hike alpine tundra, raft whitewater rapids and fish world-class rivers. Talkeetna - take-off on a flightseeing journey around North America&apos;s largest peak. View the grand mountain from a scenic raft trip and watch for wildlife. Overnight in Talkeetna. Travel over Hatcher Pass and visit Independence Mine Historical State Park. 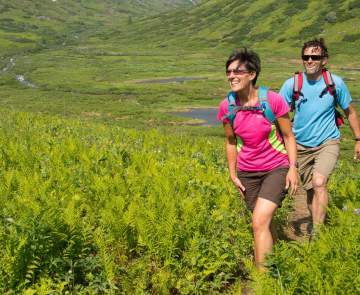 Hike and pick berries in the beautiful Alpine tundra. Enjoy a gourmet lunch at the summit. Drive up the Glenn Highway (a National Scenic Byway) to mile 100 and enter Glacier Park, a private entrance to Matanuska Glacier where you can drive up to the face and hike on the ice. Overnight in Palmer. Today you can fish for one of five species of salmon in the Mat-Su Valley&apos;s world-class rivers. Hire a guide to take you to a "hot" fishing hole and don&apos;t forget to buy a derby ticket! Overnight in Wasilla.